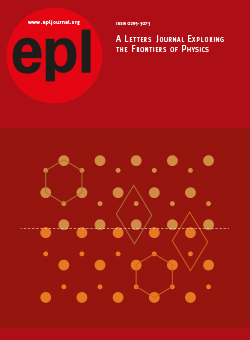 Our vision is for EPL to become a leading home for global physics letters, to offer rapid publication of ground-breaking physics results from the international community, and to provide the broadest coverage of physics research, including those letters with application potential. Perspectives - a new type of article for EPL - commentaries authored by leading researchers aimed at highlighting the significance, impact, progress and wider implications of their research field. Compilation Index - a user-friendly tool - in a journal with such a broad scope it is often difficult to locate a set of recently published articles directly related to your personal topic or needs. These collections aim to do the work for you and display many recent articles in specific research areas. Newsletters - keep in touch with development within EPL - the most recent issue and previous newsletters are always available online. EPL continues to provide authors with an option of publishing articles freely accessible by all, if a single-article fee of €1,400 is paid prior to publication. The Open Access option is offered on submission of an article to the Editorial Office. The Editor-in-Chief continues, with advice from the Editorial Board, to have latitude to reward outstanding letters by granting Open Access free of charge. Authors of these articles will be notified once their article has been accepted. All submitted articles will still be subject to rigorous peer review to maintain the high standard of articles published in EPL. Authors will benefit from expert advice by the members of the Editorial Board and enjoy rapid publication in addition to open access, where applicable. In order to keep abreast with the rapidly changing landscape of copyright and licencing regulations EPL has made amendments to its copyright policy. Those articles published in EPL through payment of a fee under the gold (hybrid) open access scheme now allow authors and third parties to use the published article as described in the Creative Commons Attribution 3.0 Unported licence. These rights allow users to copy, distribute and display the published version of the article and create derivative works, subject to appropriate attribution. All other articles published in EPL follow a green open access policy allowing authors to use all or part of the article in personal compilations or other publications of the authors’ own works, including the authors’ personal home pages, and to make copies of all or part of the article for the authors’ use for lecture or classroom purposes. After an embargo period of 12 months from the date of first publication, authors may then include the accepted manuscript (all or part), as long as files prepared and/or formatted by EPLA are not used, (a) on websites of the institution (including its repository) where the authors worked when research for the article was carried out; (b) on third-party websites, including e-print servers, but not on other publisher’s websites. In addition, authors still retain all proprietary rights other than copyright, such as patent rights and, to the extent that there are moral rights in the article, the authors expressly reserve and assert their moral rights to be identified as authors of the article. Details on the IOP Publishing open access policy can be found on the appropriate IOPscience web page here.